There comes a point in life where we have to stop living in denial and face ourselves for who we truly are. If we are lucky then that point comes sooner in your 20’s instead of later in your 50’s or better yet never. It’s the point where we stop blaming our surroundings for the “lack” in our present circumstance. It’s the point where we stop getting mad at God for not providing, when our heart was never open to receive. It’s the point where we stop pretending our problems don’t exist; and purposefully start addressing them. Lastly, it’s the point where we stop using the excuse “this is just who I am” and expecting the world to deal. Real maturity is not the ability to act like a grown up; but the ability to realize our own faults and daily press toward the better. We are much better than we give ourselves credit! We don’t have to settle being unmotivated, spiteful, jealous, lying, unloving and untrustworthy people. That is not what being made in the image of God looks like, but many of us settle every day. The reason we never mature and grow into the awesome people we were called to be; is because we cannot let go of old destructive patterns. We don’t have faith that God can deliver us from bad habits. We get frustrated trying to achieve deliverance instead of receiving deliverance. By far the biggest reason that we fall short is because we keep “breaking our own hearts.” Meaning, we keep allowing old people, behaviors and patterns to creep back in (thinking we could handle it) and before we know it we are right back where we started. I have broken my heart so many times I have lost count. I used to do this to myself all the time. I was a bona fide masochist. I would end romantic relationships, move on, become stronger, fitter and better. Then, old boy would send a text, facebook message, email or phone call and before I knew it I was right back in the same situation that I had just got delivered from. I would cry, argue and blame. I even had the audacity to say to a boyfriend “Why do you keep putting me through this” when in reality I was putting myself through the pain. It wasn’t just relationships either. I would be on a great healthy kick losing weight and feeling fit; then I would have one drunken night with tons of drinks and plenty of greasy food; a week later I put back on all the pounds I just lost. The solution. For most of my life I lived like that; from one problem to another just bouncing around not making any real progress in my personal life. I had to surrender my life (for real) to Christ. I remember praying one night and saying to God: “Listen, I have been doing things my way for a long time and it is not working out. I am heart broken and in pain. Lord, can you please take over? !” The more I prayed that prayer the better things turned out. I learned to stop breaking my own heart. I stopped setting myself up for failure by stopping situations before they started. I stopped thinking “I could handle” old situations and I just nipped things in the bud. When I received the text from an old guy I didn’t respond, I stopped putting myself in situations to binge eat late at night. 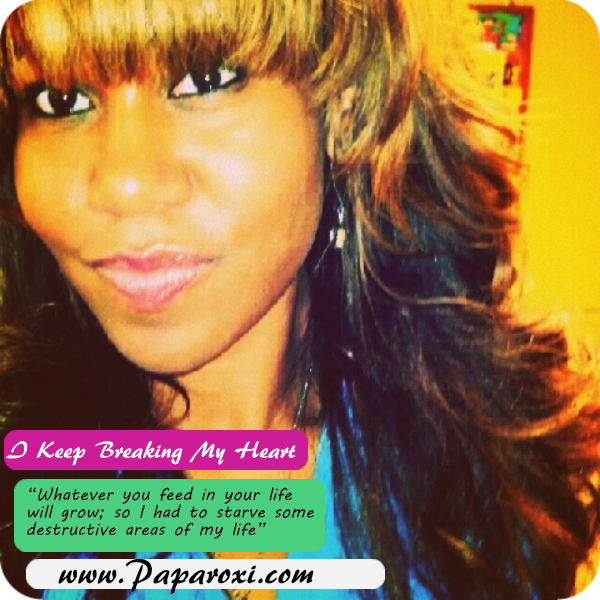 Whatever you feed in your life will grow, so I had to starve some destructive areas of my life. Change is constant, so why not change for the better? Do you break your own heart? Do you manage destructive patterns in your life? How have you recently changed to become better? Share your thoughts and comments!